I created this costume based off the DC Comics Joker character. In the "new 52" series, the Joker has had his face cut off, which he now wears as a mask. I first created the mask by taking a cheap halloween mask (in this case, John McCain, which i found for $11), cutting then painting it with acrylic paints. I attached the "face" to a headband which was fastened to a leather belt to create the effect that the mask was strapped to the head. 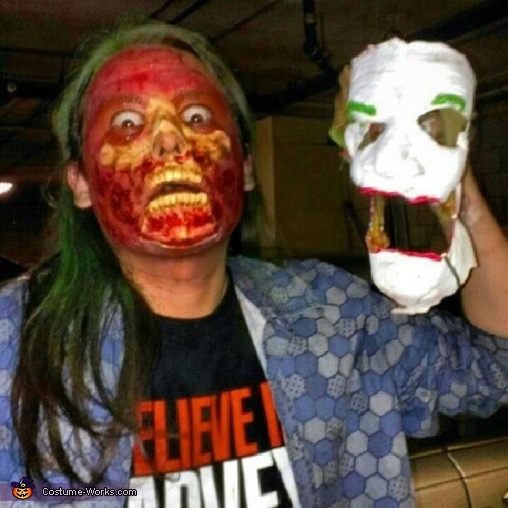 I used spirit gum to attach a prosthetic skull mask to my face, which I also painted and cut to fit, then painted my face to give it a peeled skin/bloody look. The makeup along with the mask gives the Joker his new "smile", which is stretched over his face, fastened in place with metal bands. For the metal bands, I used a flexible jewelers bracelet metal, which was easy to bend and cut as needed. The makeup used was: Ben Nye Fresh Scab for the bloody wet look, Ben Nye FX color wheel (severe exposure) for the red tones, Fake Blood, Liquid Tooth Out, Liquid Nicotine Teeth, and a Ben Nye MagicColor Creme Pencil (black). The tooth out and nicotine teeth were applied to my real teeth, just to give a gory look. For the costume, I used a purple ALTAMONT jacket, a Heath-Ledger Joker print shirt I bought at Hot Topic a few years back, an I BELIEVE IN HARVEY DENT T-shirt I obtained from the Dark Knight Viral game in 2008, red VANS shoes (RAD edition), purple socks and gray jeans. While not true the Death of the Family outfit worn by the Joker, it was my own twist of a modern day Joker outfit using familiar colors and patterns worn by the Joker throughout the years.